What types of shoes help Plantar Fasciitis/Heel Spur Pain? Why are rocker soled shoes helpful? What are some differences between Rocker Soled Shoes? Are there problems with wearing rocker soled shoes? 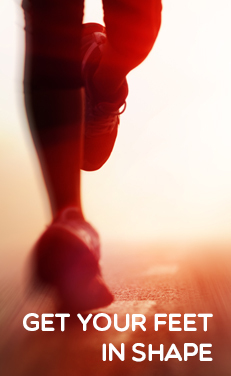 WholeFoot has three podcasts devoted to Plantar Fasciitis. If you want tolisten to them, click on this link. Plantar fasciitis, otherwise known as heel spur syndrome, is a irritation or chronic scarring of the plantar fascia, an important ligament that runs from the toes to the heel. It most commonly occurs at its attachment on the calcaneus or heel. This ligament tightens when the toes are extended or brought away from the ground, accentuates the arch and takes stress away from the bones and joints in the middle of the foot. 2. Avoiding activities that are hard on the plantar fascia such as basketball, running, and other sports and switching to stationary bicycling, swimming, and working out on an elliptical jogger. 4. Wearing shoes that protect your toes and feet from excessive motion. While many shoes that are stiff in the middle may help with plantar fasciitis (how do I determine whether my shoes are stiff enough? ), rocker-soled or rocker-bottom shoes are particularly helpful with this. Rocker soled shoes are a particular type of shoes that have a curved sole that substitute a rocking motion of the shoe for the flexion and extension of the midfoot and toes. It is helpful in treating a number of foot conditions. All rocker soled shoes are not the same. The bottom of the shoe can affect the way that the shoe and the foot work. It can also affect the way that the weight and stress is distributed across the foot. Generally, there are two kinds of rocker-soled shoe. Each is appropriate for different people and my advice is to try one of them if you have plantar fasciitis. If it makes the pain less, stick with it until the pain goes away. 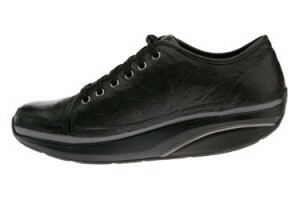 These shoes can be expected to mechanically protect the plantar fascia. Not everyone finds them helpful. The first type is the unstable rocker sole. This type has a curved sole that rolls as you walk. It is very effective at protecting the plantar fascia from stress. The problem with it is that many people feel off balance when using them. There have been some studies that show that falls are more common when using an unstable rocker sole. The sole allows for a smooth roll over which reduces stress on the midfoot joints and arch, but, because it has no flat portion, some people feel like it is difficult to stand in them. Here are two examples. I’ll put more on the list as I find them. 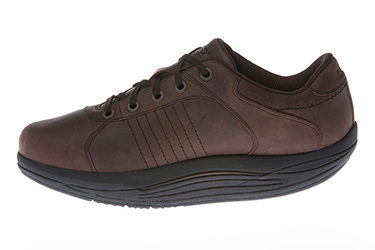 MBT Nafasi: This shoe is an excellent choice for plantar fasciitis as are most of the MBT line, but many find it unstable and may be prone to falls. Abeo Baylor: Abeo makes a line of rocker soled shoes which I would consider unstable. Note the broadly curved sole with a short flat region in the midfoot. It is an excellent choice for plantar fasciitis/heel pain. The second type is the stable rocker soled shoe. This type has little shalloping along the back of the shoe and has a flat midfoot, but is rounded on the front. It still places some stress on the plantar fascia, but is much easier to stand on and most people find less of a tendancy to fall. Overall, I don’t think they are as effective at limiting stress on arch, but I think that it is an acceptible compromise. Here are a few examples. 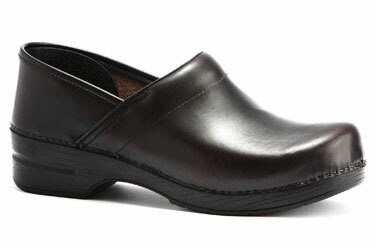 Dansko Professional: Even though the area beneath the arch is scalloped, I consider this a stable rocker. The sole is very stiff and the front of the shoe is rounded. 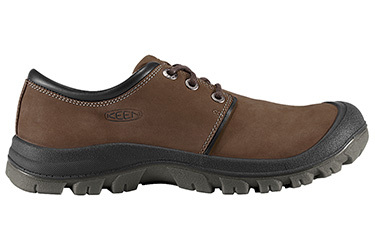 Keen Barkley Lace: Like many lines of the Keen shoe, this one has a firm, flat sole with a rounded foot that makes it functions like a stable rocker soled shoe. It would be very appropriate for plantar fasciitis. Unfortunately, there are a lot of things that go into shoe comfort and not all of them have to do with the painful heel and stress to the plantar fascia. There may be bunions or hammertoes that do not do well with a tight toe box. Ankle arthritis or Achilles tendinitis may not do well with a negative heel (heel that is lower than the midfoot or forefoot). There may be back, knee, or hip issues that flair up because there is more sway in your step. Maybe it just doesn’t work for you. These are just a “best guess” for plantar fasciitis and a solution that has worked in my practice. You should respect what works for you. In general, if you have less pain in a certain pair of shoes, try to figure out what about that shoe makes it less painful and find other shoes that have that quality. Good luck and let me know what works for you so I can learn and share it with my readers. Remember to sign up for the newletter so that you can get updates and notifications of new posts. Do you need more information on Plantar Fasciitis/Heel Spurs? Podcasts for Plantar Fasciitis: What does it feel like? What do I do about it? What is surgery about?